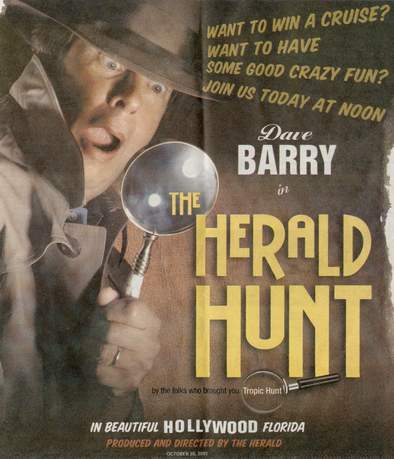 Your online guide to the zaniness of the 2001 Herald Hunt! The all new \"Herald Hunt\" debuts. Well, it\'s not really all new..well, just the name is. It was really the Tropic Hunt of years past, but since there\'s no Tropic Magazine, it\'s now the Herald Hunt. \nIt\'s still the same. Don\'t fret. \nNot to be outdone by 1998, this year\'s Hunt proved to be even more challenging�not so much for the individual puzzle sites, but more because of the Final Clue. It took 2 additional hints by Dave Barry in order to produce a winner, and the 2nd and 3rd prize winners only came along while Dave was telling the crowd how to solve everything! \nThe day started off sunny and breezy, and ended cloudy and breezy�the wind was a pain, in my opinion, but tolerable. Fun was poked at the 2000 Presidential Election ballot fiasco in Palm Beach County, some minor fun was poked at Marlin\'s owner John Henry, and the map was heavily used for many things this year compared to years past. 1. Marie must be at her office by 8 a.m. What time should she leave to work, assuming that she lives 15 miles away and commutes via the Palmetto Expressway? P - Marie should sleep at her office. 2. John is a billionaire who owns a professional baseball team. He would like a new stadium. Who should pay for it? A - Taxpayers, most of who will never use the stadium. 4. Which of the following is NOT a mineral? A - The manufacturers of the grill, for not warning him not to clean it with gasoline. B - The manufacturers of gasoline, for not warning him not to use it to clean a hot grill. C - The manufacturers of the charcoal, for selling a product that gets, like, really HOT. D - The manufacturers of the hamburger, because if not for them, none of this would have happened. P - All of the above, and very possibly Keanu Reeves. At the Young Circle amphitheater, a short play featured two characters -- Mike, a private eye, and Clara, an ingenue. Prominently displayed on stage is a picture of Albert Einstein. The dialogue reveals that Clara is 22 and Mike is 44. It also reveals that the mystery Clara is seeking to solve is the ``value'' of someone named Ed. Photo - "The Mysterious Ed" Marquee...holder. Hunters arrived at Young Circle in downtown Hollywood and discovered, among other distractions, a Florida version of the Hollywood Walk of Fame: a few dozen footprints of the famous pressed into cement squares. Astute Hunters noticed that the celebrity footprints fell into three categories -- baseball players, presidents and writers -- and that the names inscribed in cement matched those in a series of ``all-time greatest'' lists printed in the special Herald Hunt section. In each category, if you followed the footprints from one great to the next, making turns indicated by the direction the feet were pointing, you eventually described one digit for each set, forming the three-digit number 265, the answer to this puzzle. At a major intersection of Hollywood Boulevard, Hunters found a ring with an ongoing wrestling match between a single wrestler and a five-wrestler tag team. The ring announcer informed the crowd that each side claimed a title, and that this match would be the title unification bout. The wrestlers dressed oddly: The single wrestler wore a catcher's mask and a tutu; the tag team consisted of four wrestlers dressed as brides, and one dressed as an undertaker. Hunters had to figure out that the costumes represented the ``titles'' -- as in book or movie titles. The combination catcher/tutu costume represented the title Catch 22, and the tag team with the brides, et al. represented Four Weddings and a Funeral. The match ends in a draw, and the announcer proclaimed the titles ``combined.'' The solution is to combine 22 and 5; which gives you 27, the answer to this puzzle. In Anniversary Park, Hunters were handed our own version of the famous 2000 Palm Beach County presidential ballots with candidates listed on the right and left of the ballot and perforated punch holes down the center. The voters faced a choice in five races between candidates with bizarre names. The key to solving this puzzle was to remember that this was a ``butterfly'' ballot. Alert hunters had noticed an ad in the Herald's Hunt issue for a phony hobby shop, listing the names of real butterfly species; those were the names to vote for on our butterfly ballot. Once Hunters punched out the five correct holes, they had to decode the instructions on the ballot that said: ``For your vote to count, the ballot must be properly aligned, as indicated.'' The ``as indicated'' referred to four small butterflies on the Hunt Map, spaced so they lined up precisely with the corners of the ballot. When the ballot was placed over the map aligned with the butterflies, the five punched holes circled five letters on the map: CMXLV, which, in Roman numerals, is 945 -- the answer to this puzzle. At a corner downtown, Hunt volunteers were handing out trick-or-treat bags printed with a strange rhyme: ``The trick is in the treats. But before you masticate, calculate." There were three misspellings of the word ``street'' on the Hunt Map, where it was spelled ``Streat'' instead. This referred to the ``treat'' mentioned on the bag. If you went to these locations, you found more volunteers handing out different candies: M&Ms, Three Musketeers, Baby Ruth bars and Double Bubble gum. You had to ``calculate'' the value of these treats. M & M is 2,000 in Roman numerals. Three Musketeers equals 3. The Baby Ruth referred to something in the Hunt issue concerning how Baby Ruth candy got its name; in the trivia item is the phrase, ``count this as 14.'' So 2,000 + 3 + 14 = 2017; you then doubled this, because of the Double Bubble gum, to get 4034. 27. Remember where we went to chase butterflies? Remember where the hands always pointed? Well, that's S.
265. What you need to keep your footwear in shape. 945. It's an engraved invitation to divide and conquer. 4034. It's a tough call. But not if you use Madonna's record. 21296. Oh, say, "Can you see." The initial announcement: P = 13352778 The extra clue: Use the numbers to get the letters The extra extra clue: Use the phone, but not to make a call. This was the really hard part of the Hunt. The answers to the five Hunt puzzles were all numbers that corresponded to five clues listed in the Hunt issue. Then, at 3 p.m., Dave Barry read a sixth and final clue over the PA system: ``P equals 13,352,778.'' Let's take the clues one at a time. The first clue was, ``Remember where we went to chase butterflies? Remember where the hands always pointed? Well, that's S.'' ``Where we went to chase butterflies'' refers to Anniversary Park, the playground on Hollywood Boulevard where the ``butterfly ballots'' were handed out. ``Where the hands always pointed'' referred to a toy clock in the playground with large, heavy metal clock hands that swung around a clock face. The clock hands swung loosely on the center pivot, and gravity was enough to ensure that they always pointed straight down, at what would be the six on a clock. So from the first clue, Hunters could conclude that S was 6, whatever that meant. The second clue was: ``What you need to keep your footwear in shape.'' The answer is, a shoe tree. This was tricky: There was nothing on the Hunt Map that resembled a shoe tree. But there WAS a shoe. And if curious Hunters inspected the point where the shoe was located in Young Circle, they discovered a spectacularly huge and exotic tree. Get it? Shoe. Tree. Shoetree. This ancient tree had a beautifully smooth trunk that had been artfully carved with initials and other messages over the years. One of the most prominent messages was especially cryptic: ``P/S.'' This was revelation time for the smartest Hunters. They knew that S equaled 6, and they knew what P was from the final clue. P/S could only mean 13,352,778 divided by 6. Any doubt about the meaning of the tree carving was removed by the third clue: ``It's an engraved invitation to divide and conquer.'' Brushing up on their long division skills, Hunters found the answer was a seven-digit number -- 2225463 -- suspiciously like a phone number. But calls to 222-5463 in any of the local area codes came up empty. It was time to consider the fourth clue: ``It's a tough call. But not if you use Madonna's record.'' Madonna's record is not Like a Virgin or any other musical selection. It referred to another phony ad in the Hunt issue for a non-existent local race track. In the ad was listed the record for first-, second- and third-place finishes (win, place and show in horse racing parlance) for a seven-race series. The only horse that appears in every result is named Madonna. So insanely smart Hunters realized that for each number of the abortive ``phone call'' they now had further information -- either first, second or third. As it happens, the numbers on a touch-tone phone pad are also associated with three letters. If you used Madonna's record (show, win, place, show, show, place, show) to chose one letter for each of the numbers, you got: B-A-C-K-H-O-E. In the center of the Hunt Map, in an alley off Hollywood Boulevard, was a big yellow backhoe. Hunters who raced to that location discovered a sign on a back door advertising a heavy equipment rental company specializing in backhoes. The team entering that door making use of the fifth clue, ``Oh say, can you see'' by saying to the Hunt representative inside, ``Can you see'' won the 2001 Herald Hunt. CLICK HERE TO BROWSE PHOTOS FOR 2001!